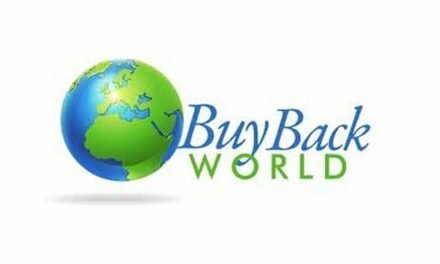 Decluttr Review – How Does This Buyback Program Compare? 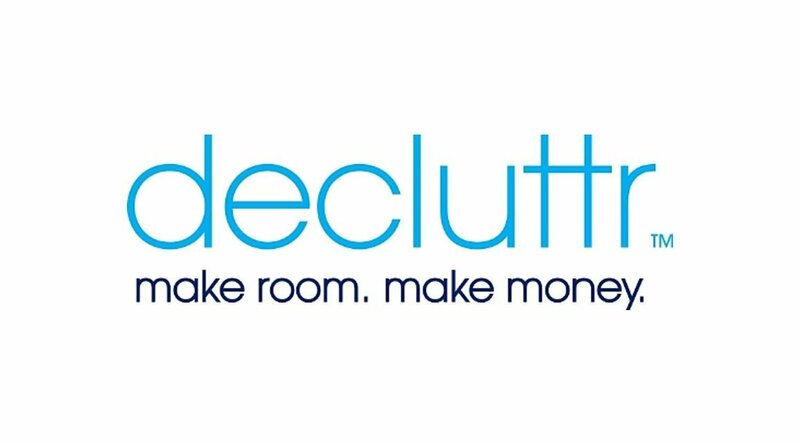 Decluttr buys and sells a wide variety of used smartphones, tech, books, and media. They generally get good reviews online, but a deeper dig reveals a bad habit of requoting. That said, their payout and shipping options are good and their reputation is overall pretty good. Think carefully before using their services, but they’re not a terrible choice. Decluttr.com is nothing if not unique among the site we’ve looked at so far. Their US office is based in Georgia, but, in reality, they’re an offshoot of musicmagpie.co.uk, a hugely successful company founded by UK music industry veterans Steve Oliver and Walter Gleeson. 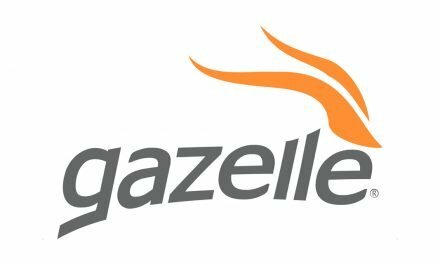 While MusicMagpie has been endlessly profiled in the UK, Decluttr has stayed smaller and flown a bit more under the radar. Their press and accolades are limited, but their reviews are good – an “Excellent” from TrustPilot and an A from the Better Business Bureau. 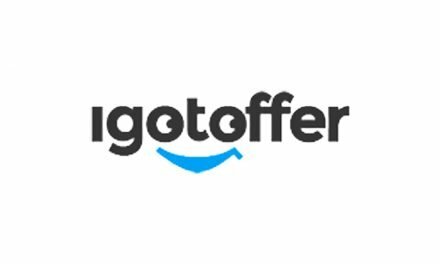 Overall, they seem to be generally well-rated and considered trustworthy – a very good attribute in a reselling site – though their reputation is not entirely sterling. 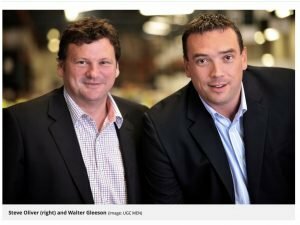 Oliver and Gleeson started out retailing second-hand CDs and DVDs but their businesses have since expanded to include the buying and reselling of used video games, cellphones, textbooks, LEGO®, game consoles, tablets, Kindles, wearable tech like the Apple Watch, and most Apple products. They run the gamut on buying used smart phones, so odds are good they’ll be able to give you a quote for whichever device it is you’re looking to release from your possession – plus they’ll buy your LEGOs by weight, which is neat. 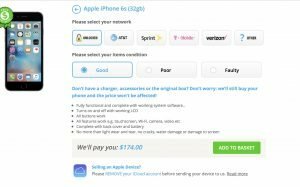 Getting a quote for your iPhone is very easy – it works like many other sites, a few clicks to indicate your phone’s condition and specifications and you have an instant quote. That said, it’s a little less smooth for other tech and smart phones, and for media items (like CDs, Blu-Rays, etc.) they ask you to type in or scan the media’s barcode using their free app, which could be cool or frustrating depending on the state of your barcode and your willingness to download more apps. The UX of the site is a little funky if you’re not selling an iPhone – it switches to a drop-down menu instead of the multiple-choice pages with images and options you typically see. 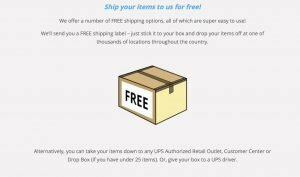 They send you a free UPS shipping label, though you will have to buy (or gather) your own shipping box or envelope. Decluttr pays all shipping costs. 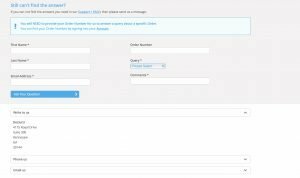 Decluttr.com offers payments by check, direct deposit, and PayPal. Once your items are received and checked to make sure they match what you were quoted for, payment is issued next business day. According to their website, direct deposits typically take approximately 3 days to arrive from being issued and checks take up to 10 business days to arrive in the mail. This means from sending to money in the bank, you’re likely looking at 2-3 weeks. Decluttr offers an array of Customer Service options. They have a Support & FAQ page for looking up common questions, an online contact form, an email address, mailing address, and phone number where they can be reached Monday to Friday, 9-5 pm (presumably EST since they’re based in Georgia). 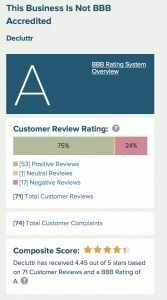 The customer service team gets a mixed bag of online reviews. Some say they’re prompt and professional, while others have complained of rudeness and issues getting through to someone and delays in communication. Keep your expectations low here and maybe you won’t be disappointed. In terms of bonus features, Decluttr doesn’t make any lofty promises. They offer a 10% student discount for those buying and a 10% bump up for students selling books, tech, and so on. They also give a $5 bonus for any friend you invite who uses your code and registers for the site. Their touted “Tech Price Promise” is a little underwhelming – if they requote you and you don’t want to accept the lower quote, they’ll ship your tech back to you for free. Zip-a-dee-doo-dah? Here’s the thing. Decluttr typically gives the highest price offer for most or all devices you can find online. Which is great! But – and this is a big but – they’ve been knocked for requoting, especially on iPhones. It seems people selling video game related merchandise usually have a good experience, but otherwise there’s a possibility you’ll get a lower price than originally offered. Again, lots of reviewers seem to have had a positive experience, but those with complaints have pretty much the same complaints across the board, and the biggest one is requoting and, in particular, requoting on the big-ticket items like iPhones. So seller beware! Decluttr is hit and miss. That said, it seems they’re active on their social media and BBB page, so if you have trouble, make noise and you’re more likely to get a satisfactory resolution. As with most of these sites, it’d be prudent to document the condition of your goods before ending them off just in case. If you’re looking to sell your video games or willing to roll the dice a little, Decluttr is a great option. If all goes well, you’ll get a very good price, free shipping, and a relatively fast and convenient payout. Unfortunately, there is the dangling possibility of requoting which could cause trouble – and with an uneven customer service team, you could end up in a battle you’d really rather not fight. Follow your gut and, if this seems like the right choice for you, go for it. Just make extra sure your Apple devices are unlocked and disconnected from iCloud before sending! 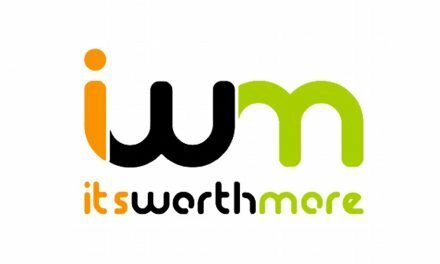 PreviousItsWorthMore.com Review – A Top Notch Service, But Is It Right For You?